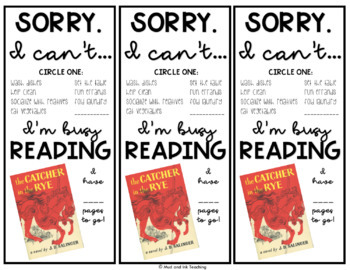 If you're like me and you have no problem assigning reading homework over a holiday break, have a little fun with your kids! 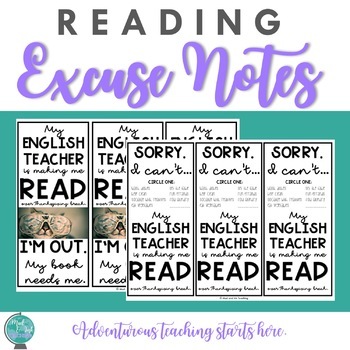 I made these bookmark sized handouts for students to take home and use as "excuses" to not do chores or spend awkward moments with family members. It's all in good fun, of course. 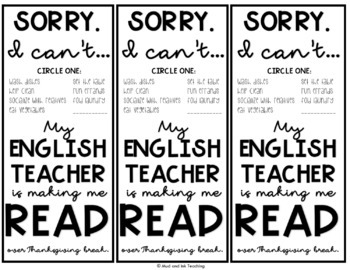 This product does not endorse students alienating themselves from their families over break -- it's just a playful way of trying to change their mindset and attitude toward doing reading homework over a break. I will attempt to add more and take requests via instagram @mudandinkteaching. I tried to make most of these as templates so that you can save the image as a JPEG or PNG and then add your own text and images in the blank spaces! 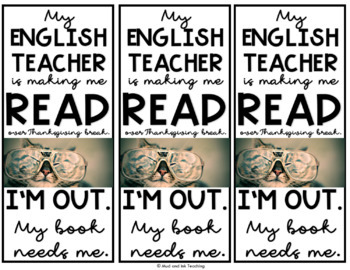 Have fun and happy reading! !